Corporates, investors, and financial institutions have relied on FX Options and Structured Products for more than a decade for dependable, real-world insight into using structured products to achieve cost savings, risk controls and yield enhancements. 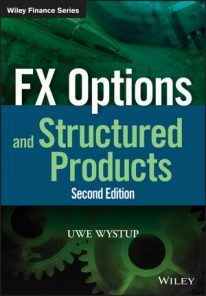 In this fully updated and expanded Second Edition, expert practitioner and celebrated academic Uwe Wystup goes beyond today’s literature and textbook material on options to empower practitioners with a fresh examination of the most popular products, their pricing and how they’re risk managed and hedged, along with best practices for using them in compliance with up-to-date regulations and accounting standards. Brand-new material to this edition covers long-term FX-linked structures; litigation cases; treasury case studies; currency fixings; and much more. 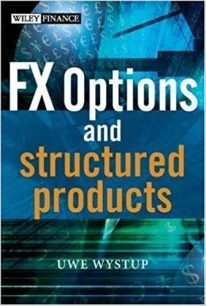 Master the why and how of FX market products and strategies with the highly illustrative, hands-on guidance in FX Options and Structured Products, Second Edition. 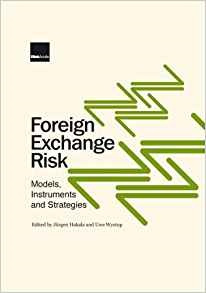 Once you have a textbook understanding of money market and foreign exchange products, turn to FX Options and Structured Products, Second Edition, for the beyond-vanilla options strategies and traded deals proven superior in today’s post-credit crisis trading environment. With the thoroughness and balance of theory and practice only Uwe Wystup can deliver, this fully revised edition offers authoritative solutions for the real world in an easy-to-access format. Getting close to the everyday realities of the FX derivatives market through new, illuminating case studies for corporates, municipalities and private banking FX Options and Structured Products, Second Edition is your go-to road map to the exotic options in FX derivatives. Many have asked me over the years to make solutions to the exercises available. The second edition now contains about 75 exercises, which I believe are very good practice material and support further learning and reflection, and the solutions to all of the exercises are now available as a separate book. It is now even easier for trainers to use this book for teaching and exam preparation. This manual is sold through MathFinance at a total price of EUR 22.30 (incl. Postage and handling and 7% VAT). 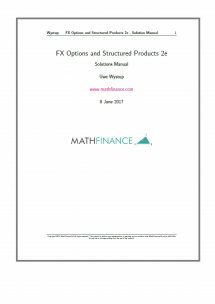 If you wish to order this item or place bulk orders please contact us at info@mathfinance.com.